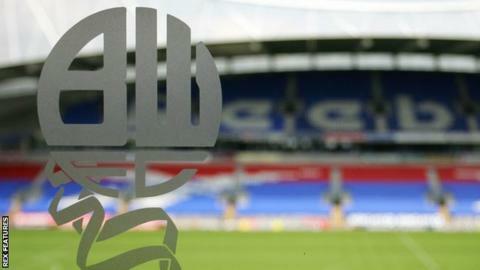 Bolton Wanderers players and staff are still waiting to receive their wages for March, two days after they were told a potential new owner would ensure salaries were paid on Friday. On Wednesday owner Ken Anderson said the club could be sold "within 48 hours", but a deal is yet to be done. February's staff wages as well as players and coaches were paid late. Meanwhile, former Watford owner Laurence Bassini is in talks over a takeover, BBC Radio Manchester report. Bassini, who took over at Vicarage Road in 2011 before selling to the Pozzo family a year later, was previously given a three-year ban from being involved in a position of authority with any English Football League club in 2013. The punishment came after he was found guilty of misconduct and dishonesty over financial dealings during his time with the club. Bolton, who are eight points from safety in the Championship, are to appear in court again on Wednesday over a £1.2m unpaid tax bill and other debts. They were given two weeks by the High Court on 20 March to settle their debts or risk going into administration. Wanderers visit Queens Park Rangers on Saturday.